A global data set of soil types is available at 0.5-degree latitude by 0.5-degree longitude resolution. 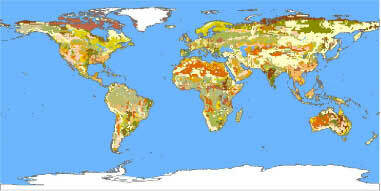 There are 106 soil units, based on Zobler's (1986) assessment of the FAO/UNESCO Soil Map of the World. This data set is a conversion of the Zobler 1-degree resolution version to a 0.5-degree resolution. The resolution of the data set was not actually increased. Rather, the 1-degree squares were divided into four 0.5-degree squares with the necessary adjustment of continental boundaries and islands. The computer code and documentation used to convert the original 1-degree data to 0.5-degree are available as a companion file. A JPG image of the data is provided in this document. The 0.5-degree soil type data in this data set are provided in three formats: the original ASCII format, GRID ASCII, and ARC/INFO EXPORT (*.e00). Separate companion files contain the soil type and continent codes used in the data set. The GIS format information is contained in the companion readme file [http://daac.ornl.gov/daacdata/global_soil/ZoblerSoilDerived/comp/readme.txt]. Image of 106 global soil types available at 0.5-degree by 0.5-degree resolution. Additional documentation from Zobler's assessment of FAO soil units is available from the NASA Center for Scientific Information. Post, W. M., and L. Zobler. 2000. Global Soil Types, 0.5-Degree Grid (Modified Zobler). Data set. Available on-line [http://www.daac.ornl.gov] from Oak Ridge National Laboratory Distributed Active Archive Center, Oak Ridge, Tennessee, U.S.A. doi:10.3334/ORNLDAAC/540. Post, W. M., A. W. King, and S. D. Wullschleger. 1997. Historical variations in terrestrial biospheric carbon storage. Global Biogeochemical Cycles 11:99-109. Post, W. M., King, A. W., and S. D. Wullschleger. 1996. Soil organic matter models and global estimates of soil organic carbon. pp. 201-222. In (P. Smith, J. Smith, and D. Powlson, eds., Evaluation of Soil Organic Matter Models Using Existing Long-Term Datasets, Springer-Verlag, Berlin, Germany. Webb, R. S., C. E. Rosenzweig, and E. R. Levine. 1993. Specifying land surface characteristics in general circulation models: Soil profile data set and derived water-holding capacities. Global Biogoechemical Cycles 7(1):97-108. Zobler, L. 1986. A World Soil File for Global Climate Modelling. NASA Technical Memorandum 87802. NASA Goddard Institute for Space Studies, New York, New York, U.S.A.